On your first turn, you will skip step 1 and go straight to choosing an action. Your available actions and potential income will be limited by the actions of those who played ahead of you. Note: Your figure is used to indicate your chosen action. Th ere are 3 such figures in each color, but only 1 of these figures is used in a three- or four-player game. Return the other 2 to the box. 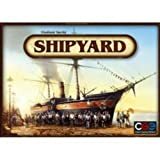 end the turn, but if a ship is completed, the starting player takes it out on a Shakedown Cruise (step 5). The second player may place his or her figure on any Action Card except the one chosen by the starting player. Order is important. The second player gets an income of 1 guilder if his or her figure is placed on one of the Action Cards behind the first player's figure. He or she gets no income if his or her figure is ahead of the starting player's figure. The second player performs the chosen action (and possibly a bonus action) in step 4, which may lead to a Shakedown Cruise (step 5). 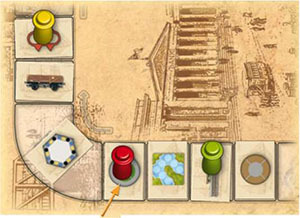 The third and fourth players' turns are similar, with each player choosing an unoccupied Action Card, placing his or her figure on it, and collecting 1 guilder for each occupied card ahead of the one chosen. Steps 4 and 5 are just like those on a regular turn and are described in detail below. After the last player has completed his or her first turn, it is the first player's turn again. For the rest of the game, all turns begin with step 1 and proceed normally. Red chooses to Recruit Crew and gets 1 guilder because Yellow is on a card ahead of her. Th e card occupied by Green does not give Red a guilder, because it is behind Red's chosen card. In a two-player game, you will use all three figures to choose your actions. Two of the figures will mark your previous turn's action and the other figure will mark the action you choose this turn. As with the three- or four-player game, your first turns are some- what different from a regular turn. The starting player chooses an Action Card from the Action Track and marks it with two figures (step 2). He or she gets no income (step 3). Steps 4 and 5 are as normal (explained in detail below). The second player chooses any Action Card except the one chosen by the starting player. The chosen action is marked with two of the second player's figures. He or she gets 1 guilder for choosing an action behind the first player's action, but gets no income for choosing an action ahead of the first player's two figures. Steps 4 and 5 are as normal. The starting player chooses one of the Action Cards not yet chosen and places his or her remaining figure on it. He or she gets 1 guilder for each occupied card ahead of the chosen card. (A card counts as occupied whether it is your figures on it or your opponent's). Steps 4 and 5 are as normal. The second player's second turn is analogous. 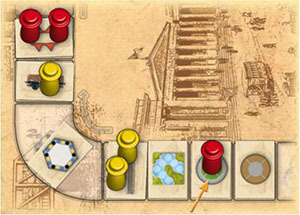 After each player has had two turns, play proceeds normally, with each player beginning at step 1. Red chooses to Recruit Crew and gets 3 guilders because there are 3 occupied cards ahead of the card chosen.